The Keep A Breast Foundation's popular “I Love Boobies!” campaign may soon find itself at the center of a U.S. Supreme Court debate. An ongoing legal battle, which originated in 2010 between the Easton Area School District board of Pennsylvania and two female students, middle schoolers at the time, began when the girls challenged their school's ban on the bracelets, meant to show support for breast cancer awareness. After being suspended for wearing their bracelets, the students, Brianna Hawk and Kayla Martinez, sued the school with the help of the American Civil Liberties Union and have been embroiled in a series of court battles and appeals ever since. Court rulings have favored the girls, pointing to the fact that the bracelets caused no specific harm or disruption. Most recently, the lower courts' rulings were upheld in a Federal Circuit Court appellate hearing, prompting the school board to vote in favor of appealing the case to the U.S. Supreme Court earlier this week. The school argues that the bracelets are lewd, and is “concerned about the implications of a hyper-sexualized environment.” Administrators also feel that the court's decision intervenes with their ability to enforce school policy within the district. Though the school hopes for the Supreme Court to provide some clarity in the matter, a hearing is not a guarantee. The girls and their lawyers claim that the bracelets are simply meant to promote awareness for a positive, nonprofit campaign, and have not been the cause of any problems at the school. In their alignment with the music scene, and events like Warped Tour, Keep A Breast has become the awareness foundation of choice for many musicians who support the cause. Do you think this case is right for the Supreme Court? 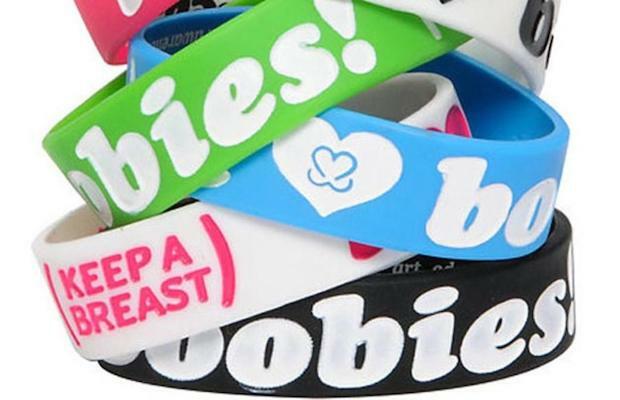 Have you ever been banned from wearing an “I Love Boobies!” bracelet? Let us know in the comments!